The Managing Director of LADOL, Dr. Amy Jadesimi was invited to speak at the United Nations on 17th July 2018 by the B-Team Africa, GSMA, UN Foundation and the organisers of the event. She joined global CEO’s to discuss the practical and policy steps needed to unlock the potential for private sector to take a lead in achieving the 17 Sustainable Development Goals (SDGs). 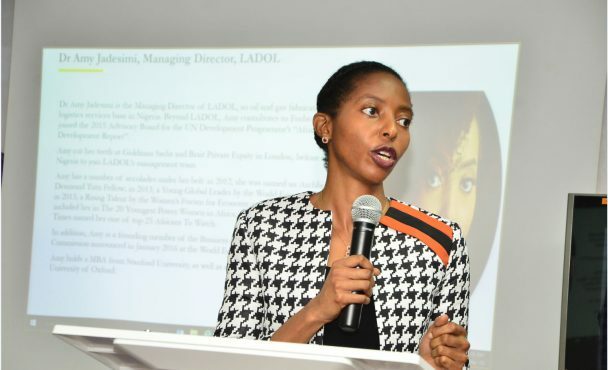 As the CEO of LADOL, a wholly indigenous company, and the only African speaking on “Unlocking the power of business – multi-stakeholder collaboration” Dr. Jadesimi was able to offer a unique perspective. LADOL itself is a practical, tangible example of how the real private sector in low income high growth countries can stimulate significant economic growth and job creation through pursuing sustainable business operations and opportunities. LADOL is an industrial Special Economic Zone, built out of a disused swamp into what is now the only fully integrated deep offshore logistics base and the largest ship yard in West Africa. These developments at LADOL could create 50,000 direct and indirect jobs. But the World Bank estimates the world needs 600 million new jobs, 80% of which will come from indigenous companies. If these companies develop sustainably they will be resilient and gain higher returns. Nonetheless the decks are still largely stacked against such indigenous enterprises. LADOL’s development took over 15 years and the journey was extremely arduous. The world has only 12 years to achieve the 17 SDGs, therefore the Managing Director of LADOL is engaging with world leaders to help put in place policies, financial solutions and partnerships that will drive investment and expertise into more real private sector companies in low income, high growth countries across the world. Ensuring that they adopt sustainability as a winning business strategy and thereby drive achievement of the 17 SDGs by 2030. Speaking ahead of the forum, Dr. Amy Jadesimi, Chief Executive of LADOL said: “the 17 SDGs and 165 targets are a free template for the most profitable business strategies of the future, private sector will lead in achieving the SDGs, as companies that adopt sustainability now will outcompete companies that do not. In so doing they will also help to create a peaceful and prosperous sustainable world”. Speakers for the forum include Dr. Amy Jadesimi, CEO of LADOL; Jean-Piere Clamadieu CEO, Solvay; Kimmo Tiilikainen, Environment Minister, Finland Government; Guy Ryder, Director General, ILO; Sunny Verghese, Co-founder & Group CEO, Olam International & WBCSD Chair; Ana Dolores Roman, CEO, Pfizer Ecuador. Dr. Jadesimi was a Commissioner for the Business and Sustainable Development Commission, chaired by Lord Mark Malloch-Brown and in March 2018 she was invited to join the B-Team Africa. The B Team Africa is a coalition of Africa-based business and civil society leaders working collectively to drive progress across the continent. The B Team Africa’s leadership includes Safaricom, M-KOPA Solar, Kenya Commercial Bank Group, Isuzu East Africa, Made in Africa Initiative and SoleRebels’ CEOs, as well as Drs. Mo Ibrahim and Ngozi Okonjo-Iweala. Together, we are encouraging Africa-based companies to make strong ESG-oriented commitments, including the adoption of science-based and net-zero targets and invest in renewable, clean energy.